Electric kilns, manual kilns, oval kilns, glass kilns, doll kilns, jewelry kilns, metal and enameling kilns, china painting kilns, front loading and top loading kilns, home kilns, production kilns - all kinds of kilns! technical support, best kilns and or specific shipping needs. 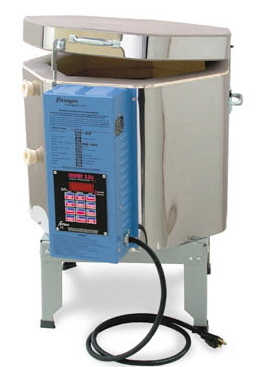 For all 3 phase, add $75.00 to kiln price. 14 1/2" x 13 1/4" deep, Cone 4, 1.40 Cu. Ft.
13 1/2" x 13 1/4" deep, Cone 6, 1.22 Cu. Ft.
16 1/2" x 13 1/4" deep, Cone 10, 1.75 Cu. Ft.
16 1/2” x 13 1/4” deep, Cone 10, 1.75 Cu. Ft. The portable and convenient Paragon FireFly Digital will give you unbridled freedom. It plugs in almost anywhere on a household 120 volt outlet. An excellent choice for beginners, it fires rapidly with a digital Sentry Xpress controller at the precise rate and temperature you choose. The controller stores up to 4 custom programs in memory. The display shows the kiln temperature throughout firing and cooling in your choice of °F or °C. Customize your programs with up to 8 segments per firing. The firing results will thrill you. Create breathtaking glass bracelets and pendants in the 8" square x 4 1/2" high interior. Fire small glass casting molds and even drop molds. But you are not limited to glass. Fire porcelain or stoneware pendants and beads. Test glazes. The kiln has plenty of power to reach 2350 degrees F.
The Paragon FireFly is made of durable 2 1/2" thick insulating firebrick, which stores heat for slow cooling and safe annealing of smaller glass projects. The solid 2 1/2" thick firebrick top and bottom help seal in the heat. To strengthen the firing chamber, the firebrick corners are fitted together with L-shaped notches. This type of joint lasts longer than the butted joint and the "picture frame" mitered joint found on competitive brands. Dropped, recessed grooves protect the replaceable heating elements for longer life. 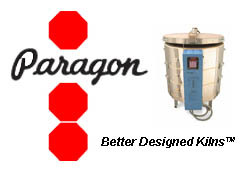 Wires are fastened to the elements with heat-dissipating connectors refined and proven over many years in Paragon kilns. This kiln is built to last. Elements are coiled from the finest high-temperature wire available. A built-in 3" tall steel base with mar-proof rubber feet covers the entire firebrick bottom. 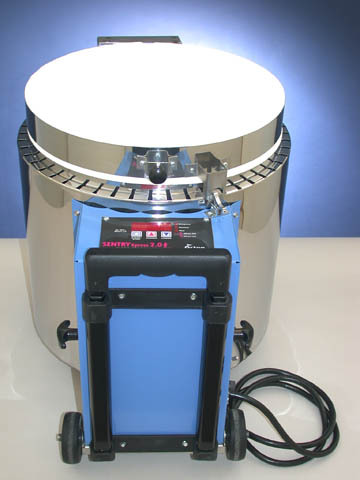 Place the kiln directly onto a heat-resistant work surface. No extra stand is needed. 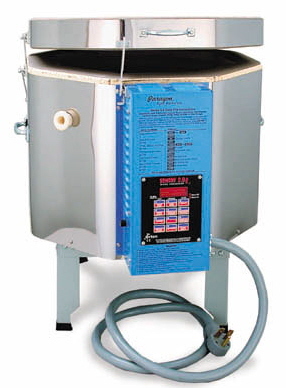 The portable Home Artist kiln sets up in minutes. It plugs into a standard household outlet and features a collapsible luggage carrier for easy moving. Take it with you on vacation or to seminars. The kiln fires rapidly up to 1900°F. It uses space-age ceramic fiber insulation, noted for energy efficiency. It is large enough to fire 10” china plates. The digital controller fires to pyrometric cones with 3 key simplicity. For raku firing, purchase the optional lid safety switch. The Home Artist is ideal for traveling teachers, because it cools rapidly. It is also popular with raku artists. 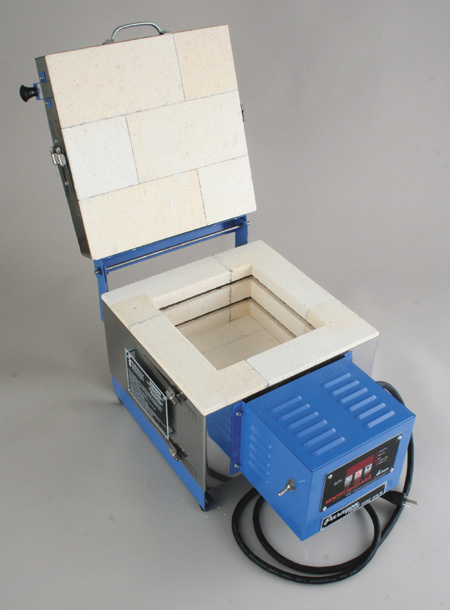 It is easy to hold a raku party with a portable Home Artist kiln. The ceramic fiber is hardly affected by the thermal shock of opening the kiln at raku temperatures. Energy-efficient ceramic fiber firing chamber heats rapidly. Light enough to take anywhere. Telescoping luggage carrier with wheels for easy moving; collapses for convenient storage. Handle lifts up and kiln rolls like a mobile suitcase! All prices are subject to change without notice due to manufacturer's price increases and fuel surcharges with shipping companies. We reserve the right to adjust pricing accordingly. Please be advised - Paragon Kiln Manufacturing Policy - Small hairline cracks in kiln brick are cosmetic and do not affect the firing performance of a kiln.